How do you become an astronaut? When will there be a manned mission to Mars? Will I ever be able to holiday on the moon? NASA Administrator Charles Bolden arrives in Dublin on July 12 and we are giving you the chance to ask him whatever you want. The best questions will be put to him and he will answer them on our YouTube channel. 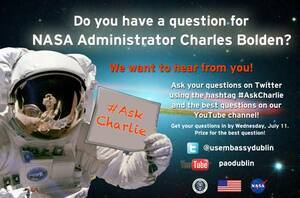 Ask your question on Twitter and include the hashtag #AskCharlie. Questions need to be in by Wednesday, July 11 and there will be a prize for the best one. Posted in Misc and tagged NASA at 2:58 pm on July 6, 2012 by Ewok.